My failed love story and Ritambhara Sahni's belly dance institute Mumbai. This story is dedicated to how belly dance with Ritambhara Sahni has a hand in me loosing the love of my life and getting me to a new place. This is definitely worth a read. 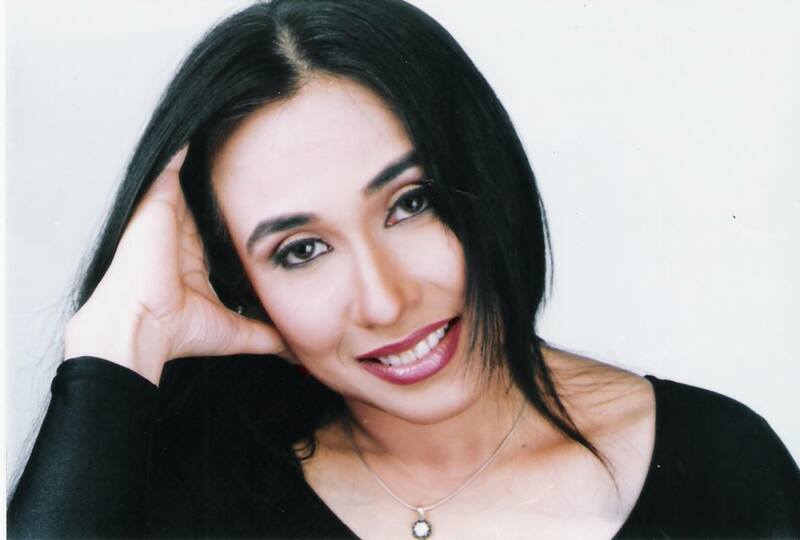 Ritambhara Sahni - MY FAILED LOVE STORY. A 21 years old average looking girl – not very intelligent or out of the world beautiful – NEVER had a boyfriend ever and I give tuition's to small kids. I meet this very ordinary looking guy at a park for my evening walk – got talking to him- he was really sweet, nice and caring. A friendship realized and so our tale began-exchanged numbers- Facebook friends – Whats App/ on the phone all day till we would meet each day at the park. he was witty, intelligent, funny… gave me a lot of attention and showered me with compliments all the time-- I began to feel wonderful about myself. Oh! I loved talking to him - had him in my thoughts 24/7. If he would not call -I would miss him. So I didn't just fall in love with, I was addicted to him. in all possible direct and indirect ways and I was the right girl for him and I told him that I felt the same. It felt special to be loved and to be told that I WAS THE ONE FOR HIM. I developed a new radiant self-image from the power that comes from being desired. We soon crossed all the parameters of a love relationship and love made my days special. I joined this belly dance class - Belly dance Institute Mumbai by Ritambhara Sahni with my sister as my mom wanted me to accompany her. The class was amazing and my teacher Ritambhara was encouraging and always made me feel so good. Life felt complete and perfect! He and my teacher had completely uplifted my spirit and energy and had become the most meaningful people in my life. Initially, not joined belly dance on my own accord, but had begun to like the dance form a lot. He would not give me the same attention, his calls became less frequent and he was drifting away. I started to feel low. The only thing that kept me going was my belly dance class. So I kept going and I kept giving tuitions believing him when he said he was busy.- waited endlessly for his calls- Missed him like crazy and felt awful and depressed that he was too busy to be with me . WHY WAS THIS GUY NOT SO BUSY BEFORE???? I wanted to make our relationship work without letting him go and so I thought the best thing is to get married to him. I was certain he would accept without a doubt as he always said I was the perfect girl for him. And so I asked him to meet me and after a lot of persuasion he agreed, though implying that he was sparing time with a lot of difficulty. I was dumfounded and I could not understand that answer, forget understand, I could not relate to it. It made zero sense, WHY WOULD A GUY LOVE YOU SO MUCH AND NOT WANT TO MARRY YOU????? LOVE AND MARRIAGE ARE TWO DIFFERENT THINGS???? REALLY?????? I asked him why but he had no answer, he just said that for right now let’s just see how it goes and we shall see later on how he feels about the subject. If he feels like getting married to me then he will, or else he won’t but he loves me for now and advised me to live in the moment. I WAS SHATTERED AND HEARTBROKEN. WOW! !….she didn't even know what happened but I liked what she said. So I decided to attend the class. She then announced a belly dance show in which I could perform and so I accepted to and I got busy gearing up for the show. She told me whatever the problem maybe, I should divert my mind and not think about the problem at all..i did exactly that and continued to go to class and gear up for the performance. His calls had completely stopped and he disappeared from my life. I didn’t have the heart to call him either as he had abused my uplifted self-image created at one time by himself. The show finally happened and my performance changed my life. My friends and family who came to watch me were amazed at my performance. I had fallen in love with belly dance and myself and discovered a lot of potential in me. I felt stronger as a person and more assertive about myself. The compliments I got made me feel beautiful and self-worthy. And so I realized what happened with me back then was a FRAUD. A GUY WHO TELLS YOU EVERYTHING AND MAKES YOU FEEL LIKE YOU ARE THE RIGHT ONE FOR HIM, AND SAYS HE WANTS TO BE WITH YOU ALL THE TIME AND SAYS IT IN AN INDIRECT WAY THAT HE WILL MARRY WITHOUT USING THE WORD MARRIAGE – BEWARE OF THEM. Clarify right at the start what it is really and I guess don’t allow yourself to go that far until its official and he wants to marry you. I guess I was really a DUMB BLONDE back then but the classes changed me and helped me keep my sanity. Hips certainly don't lie, and if you want to get into that hot-looking LBD this New Year, get slim hips and a tummy to go with it through belly dancing. Says dance expert Ritambhara Sahni, "Belly dancing provides a workout that improves muscle tone and enhances flexibility. You are isolating and moving very tiny muscle and the variety of these movements can quicken the process of toning the core area. You shape up 10 times faster than the calorie burn and it sculpts the core. The movements: from the hip circle, to figure eight, core undulation (wave movement) and belly roll totally gets rid of the flab and tightens the stomach." Gradually increase speed and repetition of moves as you go forward, for better core-toning results. It also induces relaxation. The high-energy Latin dance workout can burn more calories than aerobics, pilates and kickboxing! 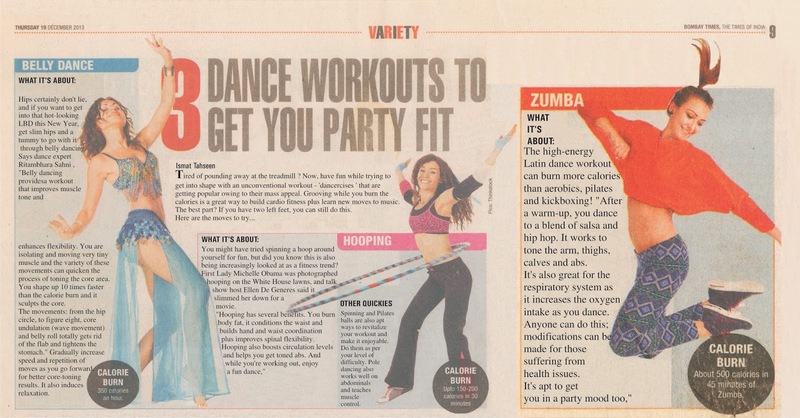 "After a warm-up, you dance to a blend of salsa and hip hop. It works to tone the arm, thighs, calves and abs. It's also great for the respiratory system as it increases the oxygen intake as you dance. Anyone can do this; modifications can be made for those suffering from health issues. 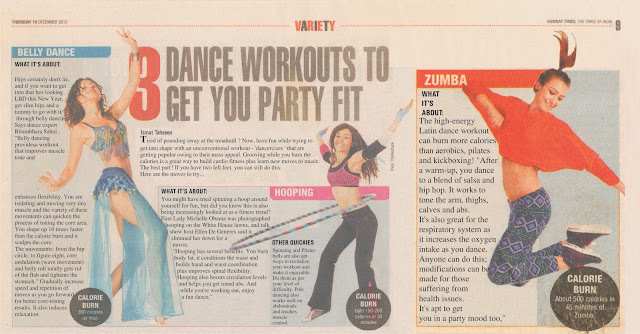 It's apt to get you in a party mood too,"
You might have tried spinning a hoop around yourself for fun, but did you know this is also being increasingly looked at as a fitness trend? First Lady Michelle Obama was photographed hooping on the White House lawns, and talk show host Ellen De Generes said it slimmed her down for a movie. "Hooping has several benefits. You burn body fat, it conditions the waist and builds hand and waist coordination plus improves spinal flexibility. Hooping also boosts circulation levels and helps you get toned abs. And while you're working out, enjoy a fun dance,"
Spinning and Pilates balls are also apt ways to revitalize your workout and make it enjoyable. Do them as per your level of difficulty. Pole dancing also works well on abdominal s and teaches muscle control. The institute has been a magical experience for me. I feel Ritambhara has created magic in my body. Today I feel more confident and more positive and I feel I can rock the world. I received immense positive energy from Ritambhara Sahni. When i discovered belly dance institute Mumbai there was no looking back. Today, after a year of fulfilled dancing at belly dance institute Mumbai, i am an instructor. . Belly dance is not just a sensuous form of dance art but also a form of exercise. 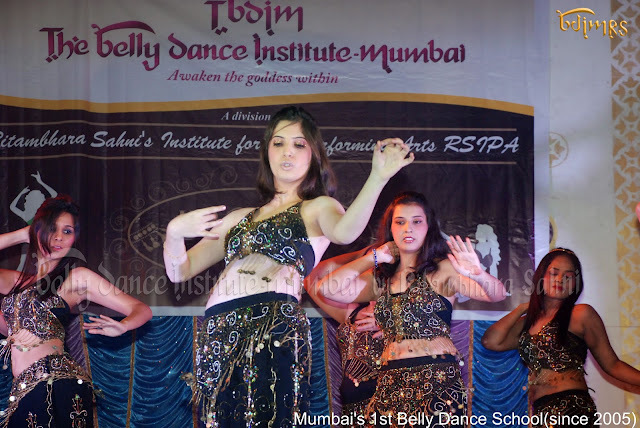 Belly Dance Institute Mumbai and discover their inner beauty and passion for dance. Ever since belly dancing happened to me at Belly Dance Institute Mumbai i have lost a lot of weight overall. my posture, balance and flexibility. The belly dance course makes the body very flexible. Ritambhara gives special attention to each individual. Her patience and she being a perfectionist helps her students to be perfect themselves. Belly Dance Iinstitute Mumbai ROCKS! The belly dance course as well the individual lessons are brilliantly structured. Ritambhara concentrates on technique as well as performance skills resulting in well rounded dancers. class is extremely energetic and enjoyable. Every session reveals something new + different. so we cant wait for the next class. It's a blast and i love it more each week.